Test from the web browser. 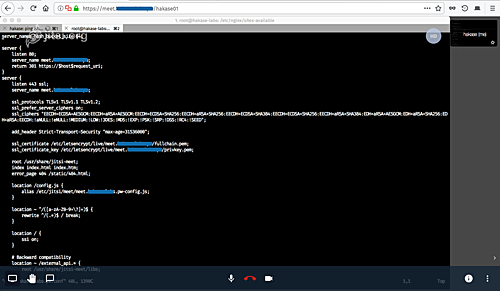 Jitsi is a set of open source projects that allow you to build a secure video conference system for your team. The core components of the Jitsi project are Jitsi VideoBridge and Jitsi Meet. There are free and premium services that based on Jitsi projects, such as HipChat, Stride, Highfive, Comcast. It has featured video conference, such as desktop and presentation sharing, invite a new member to join a video conference with just a link, and enable collaboration editing using the Etherpad. 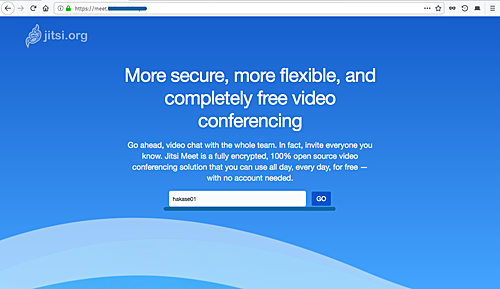 In this tutorial, I will show you how to install your own video conference server using Jitsi meet on Ubuntu 18.04 LTS. We will install jitsi meet from the official jitsi repository and make the Nginx web server as a reverse proxy for jitsi services and then secure our jitsi installation using SSL HTTPS. The first step we need to do before deploying jitsi meet to our server is by installing java OpenJDK to the system. At least, we need to get the java version 1.8 for jitsi applications installation, and we will install the Java OpenJDK packages from the PPA repository. 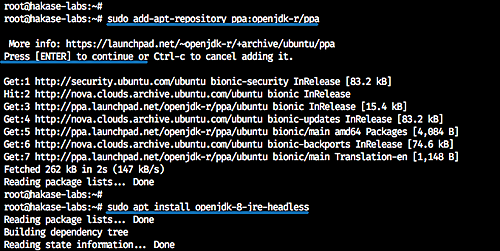 Add the OpenJDK PPA repository and install the Java OpenJDK using the apt command below. Now check the Java OpenJDK version when all installation is complete. And you will get the java OpenJDK 1.8 installed on the Ubuntu 18.04 server. In this tutorial, the Nginx web server will be used as a reverse proxy for the jitsi meet application. Install Nginx web server using the apt command below. Now start the nginx service and enable it to launch every time on system boot. The Nginx web server installation has been completed - it's running on default HTTP port 80. In this step, we will install jitsi meet packages from the official jitsi repository. We will be using a domain named 'meet.hakase-labs.io' for our installation. Add jitsi key and repository to the system using the command below. Now update the repository and install jitsi meet packages. jitsi videobridge domain name - type the domain name for jitsi installation 'meet.hakase-labs.io'. SSL certificate for jitsi meet instance - Chose the 'generate a new self-signed certificate'. Now we're done for the jitsi meet installation. All packages including jitsi videobridge, jicofo, and nginx virtual host have been automatically installed and setup. 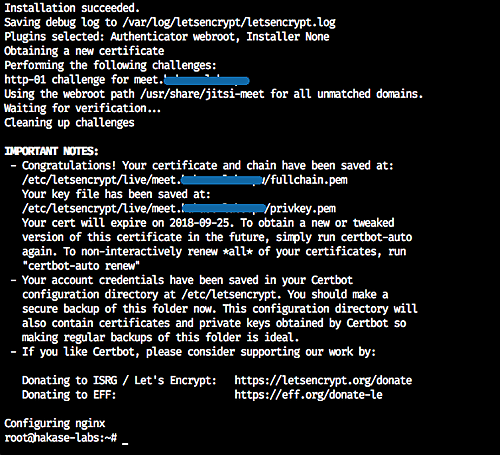 Jitsi meet provides an automatic script for SSL Letsencrypt installation and configuration. Run the letsencrypt script provided by jitsi meet. The script will install the letsencrypt tool on the server, generate SSL certificates for the jitsi meet domain name 'meet.hakase-labs.io' etc. you need to enter an email address for the Letsencrypt expired notification. And it will generate all SSL certificates for the jitsi meet domain name in the '/etc/letsencrypt/live' directory. In this step, we will configure the UFW firewall for the jitsi meet installation. We will open the SSH, HTTP, HTTPS service ports, and open the other range port that needed by jitsi meet 10000/20000 UDP port. Open those ports by running UFW commands. Now enable the UFW firewall and reload all configuration. 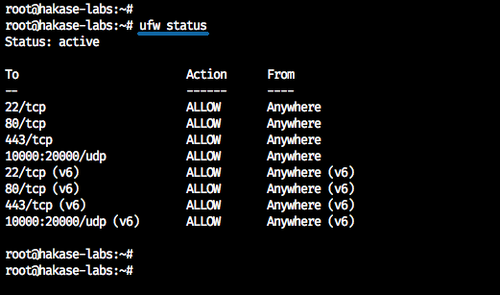 The UFW firewall configuration is complete. We will do two testing through the web browser and an android application that can be downloaded from Google Play. Open the jitsi meet installation domain name meet.hakase-labs.io and you can see the jitsi meet default home page. Type the room name you want to create and click the 'GO' blue button. And your browser will ask you for the microphone and camera use permission. Now you've already joined to the room. Another screenshot: the Desktop sharing between all members. Download the jitsi meet application from Google Play and join the room. Following is jitsi meet on android. Jitsi Meet installation with Nginx web server on Ubuntu 18.04 has been completed successfully. How can you control room creation? I need it to be secured by user and password at least. Hey great article. It accualy worked. So you have one on installing Jibri? Thanks. Hi. So does compleating this tutatorial put me in the NGINX FREE trial? I have installed successfully on Ubuntu LTS (latest ) all working well . 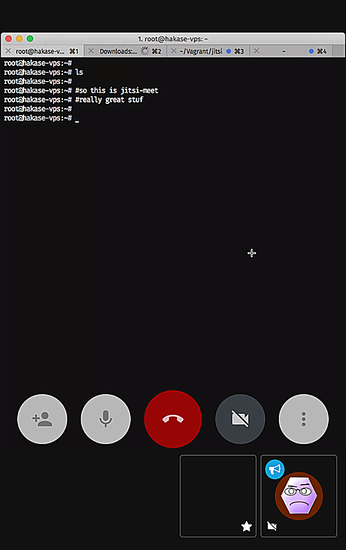 After couple of minutes of mobile video call , it hangs disconnects - says "something went wrong " try to reconnect . via laptop webrtc, its works and when third person joins it doesnt show the user or anything. Not sure im explaining it clearly . Have you experienced anything like this ? This means that Let's encrypt was not able to reach your domain name from outside to. Check your DNS settings and firewall.